Personal Journal : My teacher and mentor was Jedi Master Tyvokka and he taught me to be more patient even then most Jedi usually are. As the Clone Wars begun my padawan Tomch Kimiss and I were sent to scout the Outer Rim for planets as possible bases and we came under attack from Hutt smugglers. We were able to defend ourselves and beat back the Hutt smugglers but both of our ships were damaged and we had to crash land on a desolate moon. Unfortunately my padawan's body was badly burned from the battle with the smugglers and although she held on for a few days she passed on. Both of our ships were damaged beyond repair and I was stranded there quite a long time (nothing but primitive species on the desolate moon who had no real technology). I felt great pain in the Force as I kept but was powerless to do anything. After finally getting my repairs done thanks to a merchant ship that finally stopped on the moon, I got back to Delaya and learned that most of the Jedi were killed and if any were left they went into hiding. I checked my Jedi file and saw I was listed as "Presumed Deceased" because of my absence. In my travels I had found a small hidden moon called Avandia in an uncharted system in the Outer Rim that had plenty of natural resources and no indigenous population and I decided to settle there. With the help of new friend Pacaal Lofar (a Jawa adventurer and pilot) I built a comfortable house and small secret landing pad on Avandia. I sold my old Jedi Fighter and what was left of my padawan's Jedi Fighter (not wanting to be a target for the Empire) and purchased two new ships and modified them to my liking. Pacaal Lofar and I now wage a personal war on the Hutt smugglers in the Outer Rim and try to end their criminal ways. At times I have felt the pull of the Dark Side but fight those thoughts and feelings off to make sure I do not succumb to them. Sidekick / Henchman : My close friend Pacaal Lofar, a Jawa adventurer and pilot, is my trusted sidekick and henchmen. He carries a blaster pistol and a ionization blaster (electromagnetic pulse weapon) with him at all times. He also has his own short-range Jawa scout-fighter ship and trusts no one but me and is a wonderful pilot and mechanic. Personal Ships : I have two ships that I have modified to my liking. "The Ethereal Vision" is a Evictor Reconnaissance Ship that has a hyperdrive installed in it. It has advanced anti-detection gear and stealth package to make it very hard to track or find (includes sensor masking and jamming system that allows it to slip through sensor grids undetected). Two laser cannons and concussion missiles are used if needed and it also has a antipersonnel repeating laser to cover quick getaways on takeoff. It can seat up to 8 comfortably and has plenty of storage for long space voyages. 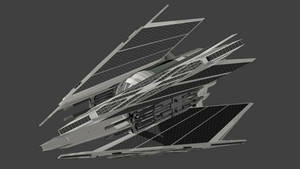 "The Viper's Storm" is a Hornet's Nest Heavy Fighter Ship that has a hyperdrive installed in it. It has a shield booster and heavy armor to deflect and absorb many hits. Four laser cannons, two twin laser cannons, concussion missiles, two ion cannons and a tractor beam are part of the weapons upgrade on this vessel. It can be piloted by one or two pilots and has a small escape pod if needed.